You are currently browsing the The Accidental Hawaiian Crooner blog archives for October, 2010. What well-known Hawaiian musician wrote an autobiography titled, A HAWAIIAN LIFE? Hint: The book was published in 2001. WillYOUbe this week’s lucky winner? **Crooner Update: Wow! Right on! You guys are so knowledgeable. I guess I need to start asking tougher questions. Ha! The correct answer is GEORGE KAHUMOKU, JR.! I loved this book. Loved reading about his life. It felt like I was sitting next to him, listening to him talk story. And this week’s winner, chosen by the technology at www.random.org, is… (Drum roll, please…) CYNDEE! Congrats, Cyndee! You are this week’s trivia SUPERSTAR! 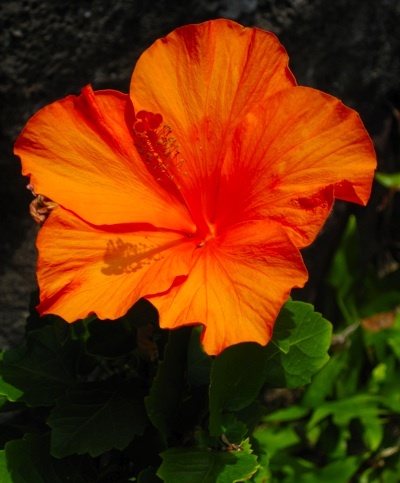 A giant MAHALO to all of you for taking a moment out of your busy Aloha Friday and playing along. I hope you’ll play again next week, too! Hope you all have a great weekend. I’m one of those folks that seem to thrive–or at least PRODUCE–when I’m under pressure. But that’s not a good thing. It makes me so nervous, watching the “countdown” as the deadline approaches. And it’s been that way as for as long as I can remember. When I was in school, I used to drive my parents crazy when it came to writing term papers or working on big projects. I would know about the deadline for months. And the night before the paper or project was due, I’d be pulling an all-nighter–frantically racing to meet the deadline. Every time. I can still here my parents asking my WHY I wait until the last minute to get things done when I’ve known about it. Why would I do that to myself? Why do I CONTINUE to do this to myself? And I still don’t know the answer! But the minute the countdown begins, I kick into OVERDRIVE and start making things happen. Prepping for this trip is no exception. I haven’t been sleeping much lately. Last night, I stayed up until–well–let’s just say I could see the first rays of sunlight coming in through the window before I decided to call it quits for the day. I’m working on a surprise for my teacher (aka Pops)! Because it’s a surprise, I can’t talk about it here on the blog, just in case he should happen to find out before I get there. But I promise I’ll tell you guys about it when I get back. It’s cool. It might even be really cool. And I can’t wait to share it with him. And then, of course, I’ve been gathering up my “Heading Back to Molokai” supplies. I never know what to bring. I try to remember what I brought/needed when I was there. And when I finally figure what I want to bring, I can’t remember where I put it when I got back! Auē! You know how women often keep a suitcase packed and ready to take to the hospital when they’re pregnant? Well… maybe I should think about keeping a bag packed for Molokai. It would certainly cut down on the anxiety factor! Ha! And, in addition to the physical preparation for the upcoming trip, I’ll need to take some time for the mental preparation, as well. It’s like being in heaven, for sure. But it can feel like I’m hitting a brick wall, too. An abrupt change in lifestyle and speed. So I know to start to prepare for that. This weekend, I’ll have to take a few long walks in the park. I need to start adjusting to the sounds of nature instead of the sounds of city life. And this trip is going to be an intensive study time for me, too. It always is when I’m there. So much to learn. In the grand scheme of things, I’m still in the embryo stage of learning about Hawaiian culture! There’s definitely a lot on my plate. And I wouldn’t change it for the world. So I’ve got a few more long nights ahead of me. But progress is being made. Each day I grow more and more excited. Do YOU wait until the last minute, too? Have any tips/tricks you can share with me and the other readers? I’d love to hear from you! One of the hula classics! We’ve been strumming this song a lot lately here in NYC. And let me tell you, it makes the chilly fall air feel a bit warmer! The song celebrates the beauty of the legendary volcanic crater, Haleakalā (House of the Sun), on the island of Maui. I love Uluwehi’s delivery of this mele. His falsetto is smooth and sounds effortless. And he captures the effervescence of the song brilliantly–it bounces! Love it! He does an interesting “double vamp” in between the verses. I haven’t heard another recording that uses this. I’m not sure why he does it that way. Maybe as a kumu hula (master hula teacher) he sings it in a way that corresponds to his hula choreography? It’s wonderful. And the slight variation makes it even more fun to listen to. This is one of those songs that will leave a long-lasting impression. It’s melody is haunting. One of my favorites. I heard it years ago when this album was first released. And it’s a song that plays sometimes as a “soundtrack” in my dreams at night. The lyrics, written for Kealiʻi’s grandmother, are rich with poetic imagery. An amazing tribute to such a special lady. A mele inoa, a name song. And a stunning musical tribute. You guys know I love a good ’70s vibe. And this song BRINGS IT. Do you need break in your day infused with sunshine and feel-good vibes? Well, look no further. This song is just what you’re looking for! I sat down to write an essay-style post this morning, but there’s just too much happening to write something coherent! As I prep for my upcoming trip to Molokai, I’m in full on “Make It Happen” mode. All of the things that I’ve been working on for the past several months need to be somewhat presentable for me to show Pops and the gang on Molokai. I’m very excited to share–and a little bit nervous, too! I hope I’ll be making him proud! And, OF COURSE, this has to be a busy week with a million other things to do, right? I mean… that’s kind of the rule. When it rains it pours! Can you believe October is almost over? Aue! Where does the time go? This month we’ve been reading Stuart Holmes Coleman’s FIERCE HEART. I know some of you have already finished the book. Right on! I’m almost done, too. I’ve been reluctant to finish this book. (I love these stories!) So we’ll do some sort of “wrap up” on November 1st. And remember: PLEASE SEND ALONG YOUR QUESTIONS FOR STUART! He’s agreed to answer some readers’ questions here on the blog! Send ‘em this way! 2. I’m working on prepping some writing and things to take with me. 3. Packing for a Molokai trip takes a while. Not because you need anything special, per se. It’s more because I need to pack in a SMART way. I need to prepare for all sorts of situations and circumstances–from working in a muddy loi to attending an event where one might need to “dress up.” AND… I need to pack as little as possible. So I find myself packing and unpacking repeatedly. And I need to pack not only clothes, but also all of the other “stuff” that one needs. My ʻukulele tuner, instant coffee, hats, tabi shoes (mine are neoprene. Pops insists I wear ‘em sometimes–even though I’d rather be barefoot), gallons of sunscreen, various lei (seed, shell, nut), books, notebooks, my Halawa “tools,” electronic recording devices, etc. For this trip, I thought I’d be proactive and I started making a list. I’ve already redone the list 3 times–and I only started it yesterday!! Are any of you MASTERS OF THE ART OF PACKING? Any suggestions? 4. I need to find my flashlights! Why? Please click HERE to learn more. I know I’m forgetting something. Thankfully, I have a week to prepare. If you guys have any suggestions, PLEASE send ‘em my way! I remember one of my birthday parties. I think I was turning seven. I remember there were a lot of kids that came to the house. I remember there was a lot of chaos. I remember being stressed out BIG TIME! I don’t really know where it started. And I don’t really know the cause. I think I might have ALWAYS felt this way. I celebrated another birthday yesterday. And I broke tradition: IT WAS A WONDERFUL DAY! I decided that this year was going to be different. No more unnecessary stress. I can choose how I want to react. I make my own choices regarding my actions. I took a deep breath when I woke up. In my mind, the old pattern of “It’s my birthday. That means Iʻm going to have anxiety attacks all day” started to loop in my mind. But this year, rather than attach all sorts of emotion to those thoughts, I let them be exactly what they are: just thoughts. And you you know what? They stopped. Just like a little kid who fusses to get what he wants and then gives up the fussiness when he realizes it isnʻt working. I decided to make it day of THANKS. For example: Things like social media (i.e. Facebook) make it really easy for folks to send a quick “Happy Birthday” message. I woke up to a bunch of ‘em waiting in my inbox. That would have stressed me out in the past. I would have felt the compulsive need to respond– immediately. I’m thankful to be connected to a network of such cool people! Here’s another example: I accepted an invitation to brunch–even though my heart was pounding at the thought of eating with a group of people. (That’s one of the leftovers of having an eating disorder. Sometimes group meals freak me out. Sometimes I manage to get through ‘em without feeling like I want to run and hide under the table.) This year, I decided to recognize the “panic thoughts” as simply “thoughts.” And I went to brunch. And it was fun and wonderful and we laughed and ate and had a great time. This year, I decided to recognize my “triggers” as just “thoughts.” I didn’t invalidate them. I didn’t scold myself for having them. I just didn’t get attached to them. It made a huge difference. This year I decided to try to remain calm. And this year, instead of being all stressed out, I was full of thanks. Thankful for the things I’ve experienced. And thankful for all of the opportunities of things still to come. Do birthdays stress YOU out? What is the Hawaiian word for EYE? **Crooner Update: I’m so thrilled to see that the Hawaiian language questions are popular! Mahalo for that! The correct answer is MAKA! And this week’s winner, chosen randomly with the help of www.random.org, is… (Drum roll, please…) CAROL! Congrats, Carol! Mahalo (thank you) to you all for playing along this week! And I hope you have a great weekend!